Spike TV will be airing the IBF lightweight title match between Mickey Bey (22-1-1, 10 KO) and Rances Barthelemy (24-0, 13 KO) at 8PM US Eastern on Friday, June 3. Here I will break my typical trend of thinking the taller and lankier of the boxers will out box his opponent. This time, rather, I predict that the Bey will out box the longer Barthelemy. 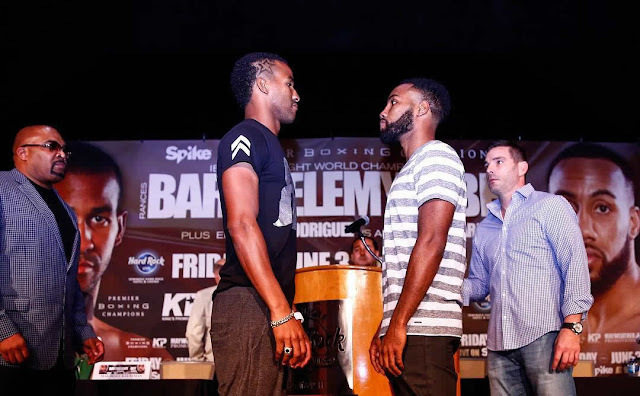 Barthelemy has freakish dimensions – 5'11 height, 73-inch reach – for a lightweight, but with a tradeoff – that he is a bit unsteady on his legs. Bey has not looked good as of late but he remains very athletic, and I believe his athleticism will overcome the length of Barthelemy, who really does not box in a manner to maximize his advantages: - I do not see him maintaining distance between Bey and himself; Bey can muscle him around inside given his lower center of gravity and stockier frame… It is possible that Barthelemy can outwork Bey, but Bey can lower his output with his footwork and pacing his own attacks. To win, Barthelemy will need to keep Bey at the end of his high output of punches – set the tempo, lead rather than countering. Bey has not performed as the slickest of counter punchers and seemed frozen against Miguel Vasquez in the recent past. Preview and predictions for IBF lightweight title match between Mickey Bey and Rances Barthelemy on Friday June 3 2016 at Hard Rock Live, Seminole Hotel and Casino, Hollywood, Florida.